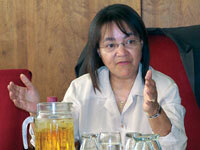 Cape Town mayor Patricia de Lille is reaching out to the youth by rapping against drug abuse. In a newly released one-minute song featuring popstars DJ Ready D and Khanyi, de Lille raps: “Don’t smart, be smart. Drug free is the way to be”. DJ Ready D refers to zero tolerance of drugs in the city and raps that treatment centres are available to the public. He hands the song over to the mayor saying, “Come roll with the mother of the city. Let’s roll with the Mayor Aunty Patty,” who then belts out the number of a toll-free helpline for those affected by alcohol and drugs. De Lille says she wanted young drug addicts to know that treatment was available at several South African cities.